The included wireless receiver is fully weatherproof. This means that you can run the USB cable from your DVR to install the receiver outdoors for even better wireless reception. Up to three different users can use the Lorex Secure at the same time. This will help keep your whole family in the know of any motion activity around your house. Additionally, there is no limit to how many accounts the system is linked to as well. So your whole family can download the app on their smart phones or tablets. 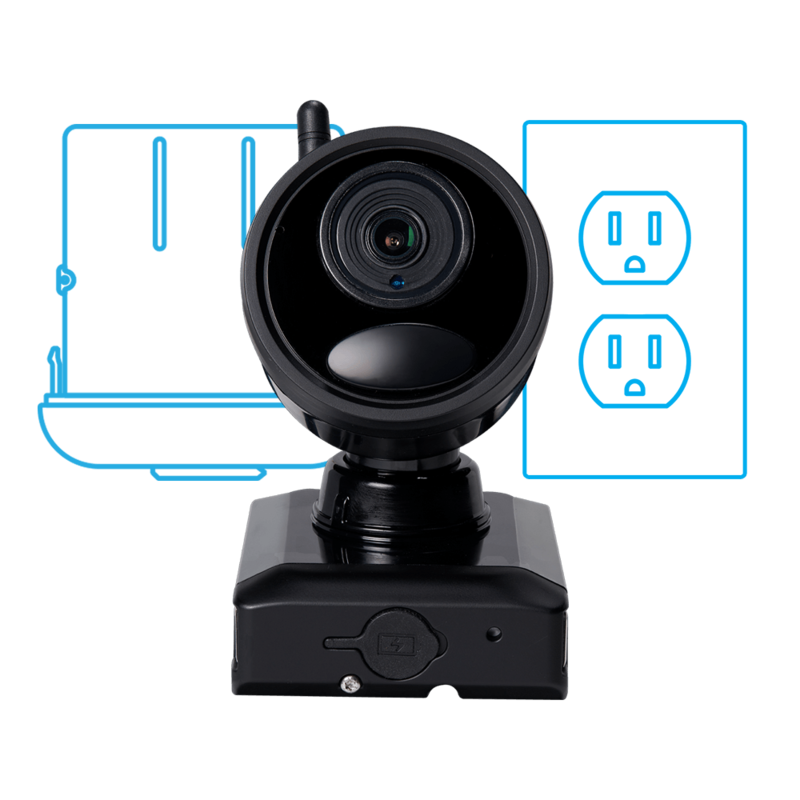 Wire-free cameras can be installed up to 450ft away from the receiver. 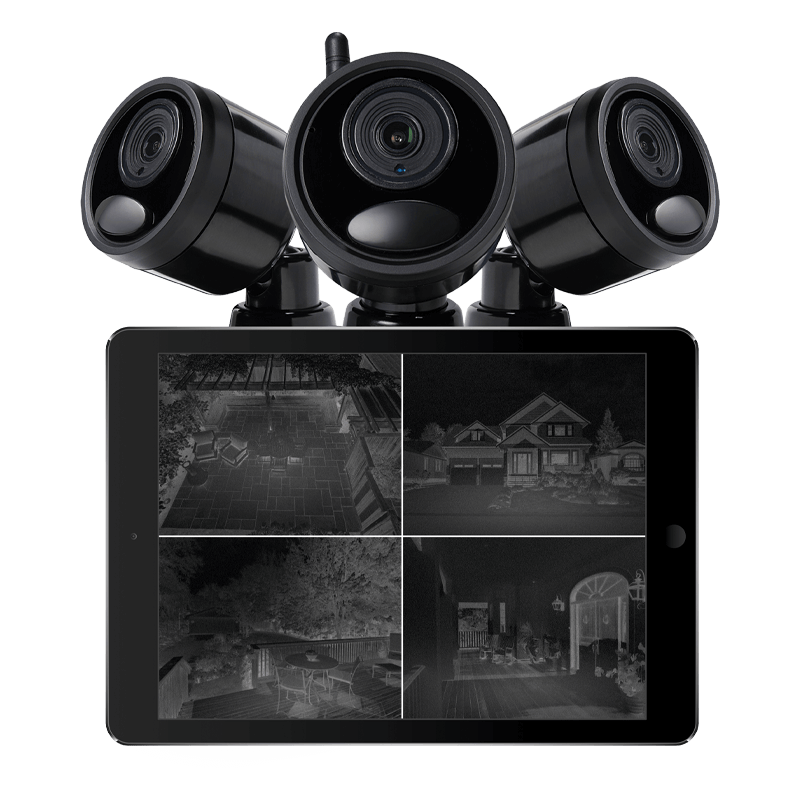 This distance allows you to place your wire-free security cameras in the locations you need them most, including detached buildings, barns, or along your distant property line. Please note that concrete, trees, or other dense objects between the camera and receiver will reduce the strength of your signal, however. These cameras also use adaptive DSSS (Direct-Sequence Spread Spectrum) technology to reduce signal interference and minimize conflicts with other competing wireless signals, such as your modem or cordless phone signals. Wire-free cameras include a powerful and long lasting battery Power Pack. With these two-cell rechargeable lithium-ion batteries, you can expect up to four months of use before having to recharge them. * The ultimate life of your battery will depend on the usage of the camera. If it is in a high traffic area, the battery life will be shorter. Don't worry, though, you can always check the battery life through the Lorex Secure app. You will also receive low battery notifications through the app as well. Another important feature is the Power Pack's convenient quick-release function, which allows for easy battery replacement without having to remove the camera from its mount. *This average is based on an average of 4 minutes of recording per day. Program your cameras to send push notifications straight to your smart phone or tablet whenever motion is detected. Tap the privacy toggle to disable live video, recording, and push notifications. Tap again to enable the camera. Not only is the Lorex Secure app absolutely free, there are no hidden fees or monthly cloud storage subscriptions with this wire-free system. Your wire-free cameras are completely cable free. In short, they're motion-triggered (that is, it only wakes up when motion is detected and goes back to stand-by mode when there is no motion) to save and lengthen its battery life. But if you desire so, they can also be converted into 24/7 wireless cameras by plugging them directly into a power source using a power adapter. Below the lens of the wire-free camera is a Passive Infrared (PIR) sensor. This sensor detects heat from moving objects such as people, animals, or vehicles. However, it does not work through glass, so it is NOT recommended to install wire-free security cameras indoors facing a window. For best results, position the camera around 20ft (6m) away from the area you wish to monitor. Securing your loved ones and property is a 24-hour operation. Fortunately, this Lorex wire-free security camera has you covered day and night ? thanks to their infrared night vision capabilities. Around the camera's lens are 6 powerful infrared LED's that capture high-quality video at night up to 95 feet away. The cameras also feature an automatic infrared cut filter that will automatically disengage at night. This ensures accurate color representation during the day and high-quality black and white infrared video through the night. Built-in PIR camera motion sensor alerts you on the Lorex Cirrus app when activity is detected (on compatible DVR).